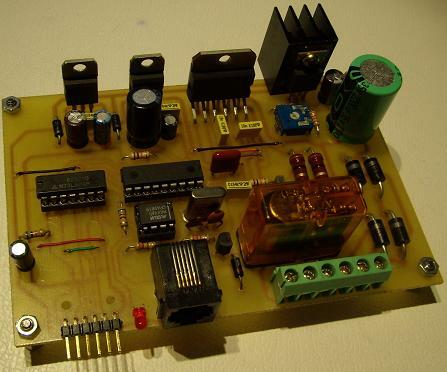 – Programming and reading DCC decoders in Direct, Paged, Register and PoM modes. NanoX-S88 has integrated a RailCom cut-out device for Bi-Directional communications. RailCom allows an external device to be able to read real data transmitted from a decoder. This data can include the decoder’s actual speed, its load, its location, the contents of CV and it its address. Due to limitations in XpressNet v.3 protocol from Lenz, only it’s possible to program and reading CV1 to CV256 in Direct, Paged and Register modes (service mode). In PoM mode (main track) you can program all 1024 CV, to read a CV in PoM mode you have to activate RailCom and use an external display as RailComDisplay or Lenz LRC120. Programming and reading CV in service mode it’s only possible in programming track. 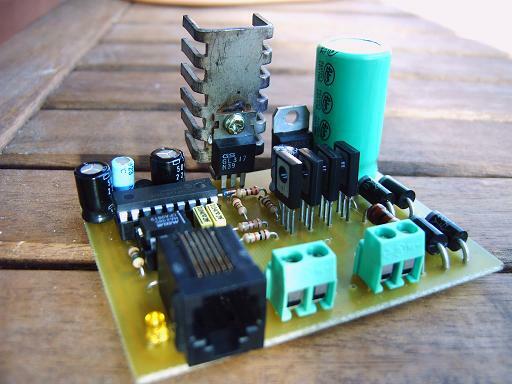 Do you burn Lokmaus amplifier and you couldn’t repair it? Lokmaus always shows E7 error, even changing conection cord, and you don’t know why? You can’t read any CV with Lokmaus? It only needs a PIC 16F628, a driver MAX485, six transistors and a few components more. 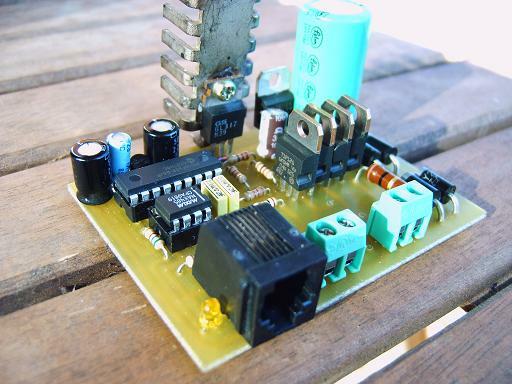 As a option you can put a relay to disconnect main track from programming track when programming a decoder. 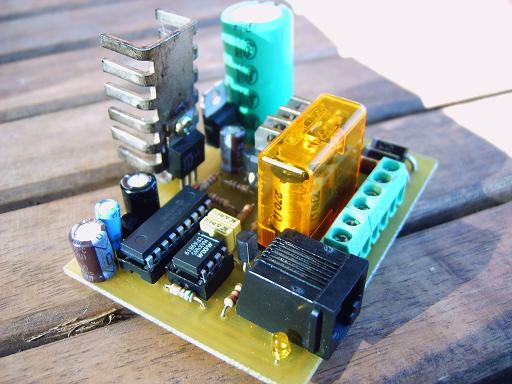 If the output of Nanox (1,2A) is not powerful enough to supply your layout you can connect one or more optoisolated booster to draw enough power. Use only optoisolated boosters because voltage on terminals is track voltage, this boosters must have protection against short circuits. Is convenient that these additional boosters disconnect track voltage when DCC signal is not present in their input, otherways locomotives can run at their maximal speed when you press STOP button or enter in programming mode. To program the PIC chip, use this HEX file. Press here to see schematics and PCB in pdf format, if you want to build your own PCB or identify componets see this tutorials. For a complete information about how NanoX works read the manual in pdf format from Adobe. Due to limitations in XpressNet v.3 protocol from Lenz, only it’s possible to program and reading CV1 to CV256 in Direct, Paged and Register modes (service mode). In PoM mode (main track) you can program all 1024 CV but you can’t read it. If relay is installed, programming and reading CV in service mode it’s only possible in programming track. With Roco 10761 amplifier it’s only possible to program CV, not reading, but with NanoX the Lokmaus can program and read CV. Lokmaus only shows two digits, and then only CV1 to CV99 can be programmed with 0 to 99 values. If reading a CV, the value is greater than 99, Lokmaus shows E3 error. 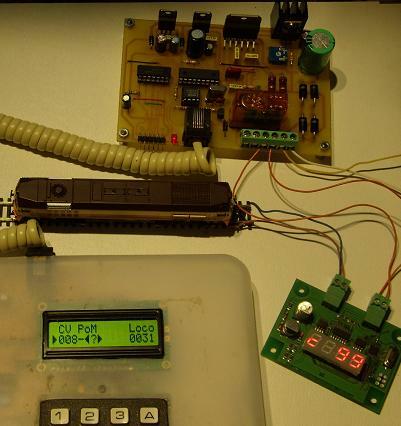 Some locomotive decoders as Zimo and CT Elektronik permit to program three digits programming a CV previously, read the decoder manual to know more about programming with Lokmaus. 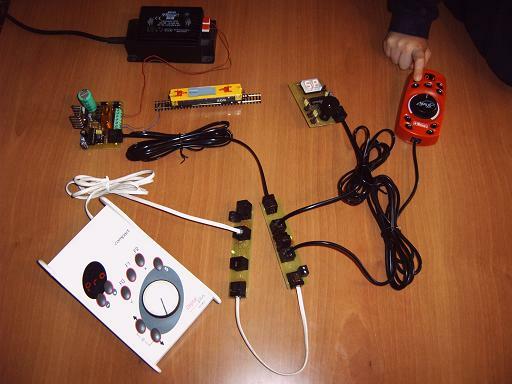 When Lokmaus acts as slave, like when you connect to NanoX, the command transmited is programming or reading in Direct mode, so NanoX only program or read CV in Direct mode, to do that in other modes use a capable Xpressnet throttle or NanoX with a PC interface like GenLI and a program as JMRI or TrainProgrammer. To program with Lokmaus, press P key during 8 seconds, it will show EP (advanced programming). Select CV number (1 to 99) with arrow keys. To read the decoder press F1 and will show the stored value, E2 if it can’t be read or E3 if value was greater than 99. To program, press F4, select the value (0 to 99) and confirm with P key. With STOP key you will exit from advanced program mode.